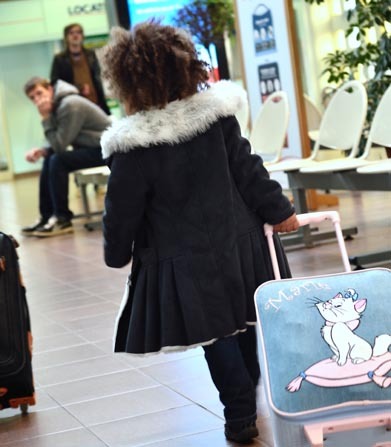 Ryanair does not permit children under 16 to travel unaccompanied. Aurigny Air Services accepts unaccompanied minors on its flights so long as they are more than 6 years old. At check-in, the child will be given a UM (Unaccompanied Minor) pack containing his or her itinerary, boarding pass, passport/identity card and the identification sheet for the person who will take responsibility for the child upon arrival at the destination. The child must keep this pack in his or her possession for the entire duration of the trip. Airport staff will chaperone the child to the airplane, and airport staff at the destination airport will meet the child at the exit door from the airplane. At the destination, the child will be released into the custody of the person designated on the information sheet. This individual must provide proof of identity. For more information, please contact the airline. Minors under the age of 18 must have an authorization to leave the country and a photocopy of the parent's identity document who signs the authorization to leave the country. We thank our passengers for anticipating this new requirement. To fly within the European Union, you must produce a valid national identity card or passport. Caution: a damaged or defaced identity card or passport will not be accepted. NB: some nationals must obtain a visa before flying to Great Britain. Children accompanied by an adult with a different surname must produce a ID card or passport. They must have an authorization to leave the country and a photocopy of the parent's identity document who signs the authorization to leave the country. You can also consult the French government's website www.diplomatie.gouv.fr, under the section "Conseil aux voyageurs"
A new passport or identity card may be applied for any time during the three months leading up to the document's expiry date. 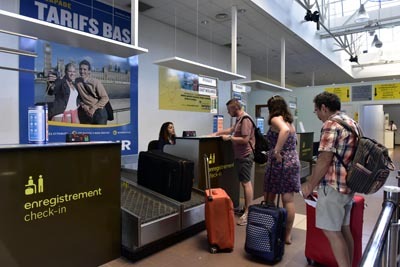 All passengers are required to check-in 2 hours before the scheduled departure time of their flight. The bag-drop desk closes 40 minutes prior to the departure time, and the boarding gate closes 30 minutes prior to the scheduled departure time of the flight. Any passenger arriving late will not be accepted for travel. 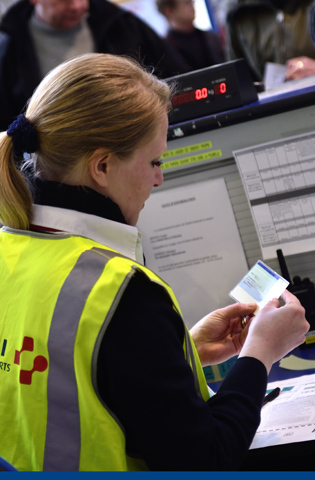 All passengers must check-in 1 hour before the scheduled departure time of their flight. Check-in will close 30 minutes prior to take-off. Any passenger arriving late will not be accepted for travel. The European Union has laid down common rules regarding compensation and assistance for passengers. This regulation came into force on 17 February 2005 and extends the scope of the protection offered to passengers and strengthens their rights. As part of a large-scale awareness-raising campaign, the European Commission has published a brochure entitled "Air passenger rights" which summarises the main features of the current legislation in this area. This brochure is available in all airports. 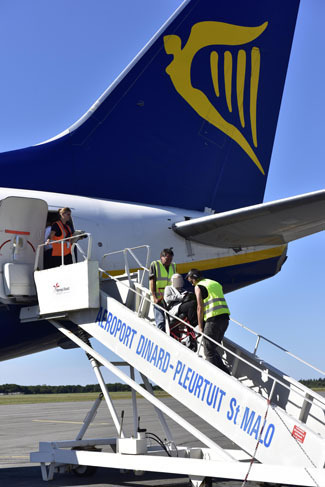 In accordance with the European regulation of 5 July 2006, Dinard Airport offers free assistance within the airport to disabled persons and to persons with reduced mobility wishing to travel by air. The service is continued during the flight and in the destination airport. Assistance is thus provided free of charge at the airport and during transit. If you wish to use this service, simply request it when placing your reservation with your airline (or travel agent). When you book your ticket, you must inform your airline or travel agent that you would like to receive assistance during your journey. To ensure optimum satisfaction of your needs, it is important to specify the nature of your disability (reduced mobility, visual impairment, hearing impairment, etc. ), the type of assistance required at the airport and any specific requirements during the flight. We recommend that you park in the outdoor parking area, located right in front of the terminal building. This car park has a disabled parking area. You can also be dropped off in front of the terminal building. 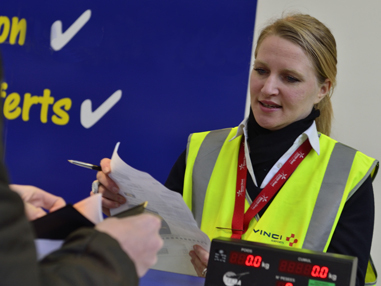 So that you can be helped within the airport, please ask for assistance at check-in or at the Ryanair information desk. Note: you must announce your arrival at the check-in or information desk at least two hours prior to the time of departure of your flight. Babies have to be more than 7 full days old to be accepted for travel by Ryanair and Aurigny Air Services. The requirements of both Ryanair and Aurigny Air Services are that once an uncomplicated pregnancy reaches its 28th week, the pregnant woman must carry a "fit to fly" letter (dated within 2 weeks of the booked flight). Women beyond the end of the 32nd week of pregnancy are not permitted to travel. In accordance with European regulations ( Directive 2013/11 / EU of 05.21.2013 ), we inform you about the possible referral to our partner "The Travel and Mediation". Contact details and referral procedures are available on its website www.mtv.travel for any claim deemed unsuccessful.